As you might have seen from the article in the West today, Fremantle’s International Street Arts Festival is back this Easter long weekend, bringing a tonne of free laughs and awe-inspiring entertainment to festival-goers. Over four days, from Good Friday to Easter Monday, some of the best buskers from around the world will perform more than 100 shows across various Fremantle locations. The festival is in its 21st year and is set to deliver the best program yet, comprising buskers, street theatre, roving performers, bands and pop-up bars and eateries. Street Arts is a hugely popular event on the state’s cultural calendar, attracting big audiences year after year. We are extremely proud to host such a unique and well-loved festival, which shines a light on our beautiful city. In a few days, Fremantle’s streets and parks will come alive with the most wonderful, weird and wacky performances guaranteed to stop people in their tracks. This year’s program features world-class local and international acts from Australia, Switzerland, France, Japan, Germany, China, Spain, Portugal, South Korea and the US. Cho Kairin: The King of the Chinese Acrobats performs death-defying, extremely dangerous stunts including his truly amazing balancing act on top of a tower of chairs. Stranger Than Fiction: The Space Cowboy and The Lizardman test a string of experiments that push the mind, body and science to the limit. Bug N’ Buzz: The talented duo transforms the Carriage Café at Esplanade Reserve into their very own playground. Coiffures Barroques: French hair wizard Christophe Pavia uses ribbons, flowers, birds, butterflies and a whole lot of whimsical skill to transform lucky audience members into countesses. Tandem: Natural Wings take to the skies at Bathers Beach with their beautiful and intricate circus choreography. For more information about the festival including performance times and locations, visit the Fremantle International Street Arts Festival website. The City of Fremantle has welcomed Labor’s commitment to establish a $1 million Music Hub at Fremantle Arts Centre should they win the coming federal election. Shadow Minister for the Arts Tony Burke announced the commitment at an event at the centre last night. The proposed Music Hub would provide a state-of-the-art practice and recording space for young and emerging artists, along with ongoing funding for tuition that will connect new talent with some of Australia’s best songwriters and producers. Fremantle Mayor Brad Pettitt said establishing a Music Hub at the centre would enhance the city’s reputation as an incubator for contemporary Australian music. “Fremantle is known around the world as a great place for enjoying and supporting live music,” Mayor Pettitt said. “Not only do we have legendary venues like Mojos, Clancy’s and now Freo.Social in the Old Drill Hall, we’re also famous for nurturing great talent, from rock legend Bon Scott to John Butler, Eskimo Joe, San Cisco and Tame Impala. “Fremantle Arts Centre already has a live music program that runs alongside its exhibition and visual art residency program. Fremantle Arts Centre has established itself as one of Perth’s most popular live music venues. 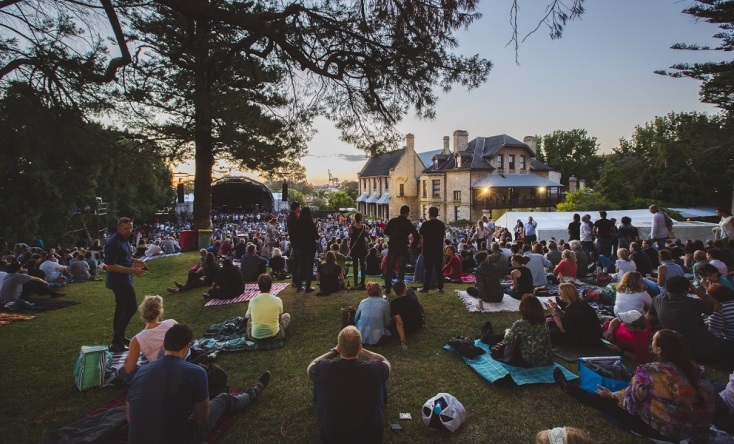 In addition to the hugely popular free Sunday Courtyard Music series over summer the centre has also hosted some of the biggest names in Australian music on the south lawn, including Midnight Oil, Nick Cave, Paul Kelly, Angus and Julia Stone and Vance Joy. Coming up next month the centre will host two shows from the reigning queen of Australian music Amy Shark on May 3 and 4, followed by global pop phenomenon Billie Eilish on May 10. For more information visit the Fremantle Arts Centre website. Angilyiya Mitchell with her artwork Kungkarrangkalpa (Seven Sisters). Photo copyright and courtesy of Papulankutja Artists. More than 120 new and emerging Western Australian Aboriginal artists are participating in Fremantle Arts Centre’s Revealed Exhibition opening this weekend. Identified as the biggest annual event on the state’s calendar for sharing and supporting emerging Aboriginal artists, Revealed showcases the diverse and vibrant state of contemporary Aboriginal art through a program of public talks, a seven-week long exhibition and the hugely popular art market. Fremantle Arts Centre Director Jim Cathcart said this year was the largest Revealed to date with even more artists taking part. “The exhibition runs from 13 April to 1 June, and all of Fremantle Arts Centre’s galleries will come alive with paintings, prints, carvings, photography, textiles, video, weaving and more,” Mr Cathcart said. Art enthusiasts can also buy original, affordable works from Aboriginal artists at the one-day-only Revealed WA Aboriginal Art Market on Saturday 13 April. 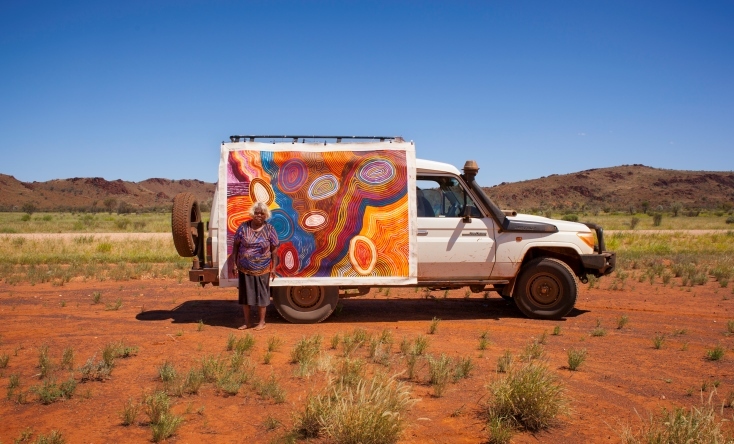 The market attracts Aboriginal artists from all over the state, with many travelling vast distances to take part, and all profits from sales are returned to the artists and art centres. “Last year’s Revealed market was attended by more than 3000 people and generated over $420,000 for the art centres and artists who took part,” Mr Cathcart said. Works start from as little as $50, and include paintings, textiles, woven items, artefacts, clothing, ceramics and jewellery. Revealed is an initiative of the WA State Government through the Department of Local Government, Sport and Cultural Industries and the Australian Government through the Indigenous Visual Arts Industry Support program. For more information about the 2019 Revealed program, visit the Fremantle Arts Centre website. Also on this weekend in Fremantle is Choralfest where some of the world’s finest choirs and choral specialists come together to perform in various locations around the city. The five-day festival (12-16 April) will see about 2500 singers from more than 40 choirs perform in over 10 venues, as well as free pop-up concerts and a procession. The Fremantle International Street Arts Festival is also around the corner. Over four days, from Good Friday to Easter Monday, the best buskers from around the world will descend on the streets of Fremantle and perform over 100 shows. For more information on events happening in April, visit the What’s On page on the City of Fremantle website. The chance to hear the personal stories of Indigenous identities will be just one of the activities held to celebrate the fifth anniversary of the City of Fremantle’s Walyalup Aboriginal Cultural Centre (WACC). As part of the month-long celebrations during March, the WACC will launch its inaugural ‘Living Library’ sessions where people can hear some fascinating and, at times, confronting stories. Indigenous activist Corina Abraham’s fight for better health conditions for Aboriginal and Torres Strait Islander people. City of Fremantle Community Development Coordinator Naomi Christensen said the Living Library will provide attendees with an opportunity to speak face to face with people in the community they may otherwise never meet. “You’ll come across the most intriguing and heart-breaking accounts from real life people about their struggles and triumphs, which are guaranteed to challenge your own biases and stereotypes,” Ms Christensen said. Living Library will be held on Saturday 9, 16, 23 and 30 March from 12-2pm, with tickets available for $10. For more information visit the What’s On page on the City of Fremantle website. Further cultural activities will take place during March, including a free Community Canvas workshop on Saturday 2 March in which participants will undertake a special five-year anniversary design. The City of Fremantle’s Walyalup Aboriginal Cultural Centre (WACC) is a dedicated meeting place for tourists, visitors and the wider community to engage in and learn various aspects of Aboriginal culture. The WACC organises Nyoongar seasonal programs, classes and workshops facilitated by Aboriginal people who are passionate about sharing their culture with the community. The WACC also hosts various events throughout the year to commemorate important Aboriginal celebrations. All people are welcome to get in involved in language, art, music, dance, tours and film screenings or explore the centre’s art galleries and artefacts mini museum. ‘Human library book’ jazz singer Lois Olney shares her story on Saturday 30 March at the Walyalup Aboriginal Cultural Centre. Introducing BEATS for BRAVERY – WA’s top human rights music festival. 2018 marks the 70th anniversary of the Universal Declaration of Human Rights. This declaration has enshrined freedom and justice for many throughout the world. However, still today there are many BRAVE activists being punished, imprisoned and even killed for speaking out against injustice, and standing up for their rights. This year the Amnesty International Fremantle Group invites you to stand with them at Beats for Bravery. Featuring live music, a limited edition art auction and guest speaker Kate Kelly of the Save Beeliar Wetlands movement, Beats for Bravery will give you the perfect opportunity to take action for Write for Rights.